Craving for sweet snacks but trying to stay healthy at the same time? Fret not! Today, we’ll be sharing with you a healthy recipe for those of you who takes fitness seriously! This recipe is brought to you by Wyatt Tan, who is a body builder and loves creating healthy recipes. A healthy recipe for those of you who takes fitness seriously! Ever since Wyatt picked up fitness, his goal was to lose weight and inspire others in the process! He used to weigh 100kg and it sure was a difficult journey for him. Now and then, he would have a sweet-tooth! And to satisfy his cravings, he had created this recipe. 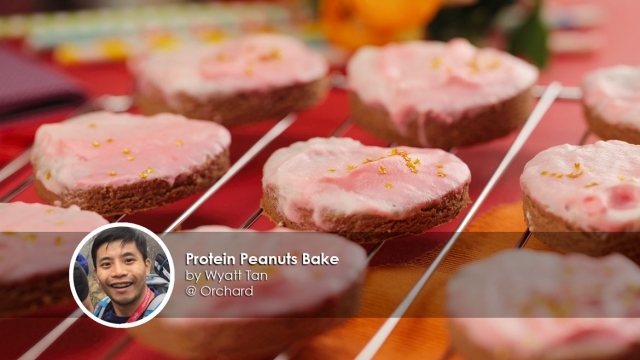 Here’s bringing to you - Protein Peanut Cookie with marbled strawberry glaze. This recipe only takes one hour to make! Here are the ingredients that you will need for the protein cookie: plain flour, chocolate protein powder, monkfruit sweetener, Crisco shortening, baking soda, baking powder, peanut butter and eggs! For the strawberry glaze, all you need is whipping cream, monkfruit sweetener, strawberry and cream protein powder and pink gel colouring. Don’t worry if the dough is crumbly! It should come together when you try to shape them afterwards. Before we start to prepare the cookie dough, preheat the oven at 180 degrees and line the baking tray with parchment paper. Add all the cookie’s ingredients into a large mixing bowl and use your hands to mix the ingredients. Don’t worry if the dough is crumbly! It should come together when you try to shape them afterwards. Otherwise, try adding in water gradually. Cut it using a heart shaped cutter! Next, grab a ball of cookie bowl and flatten the dough on a flat surface. Since Valentines’ Day is around the corner, let’s cut it using a heart shaped cutter! Repeat this step until all the dough has been utilised. 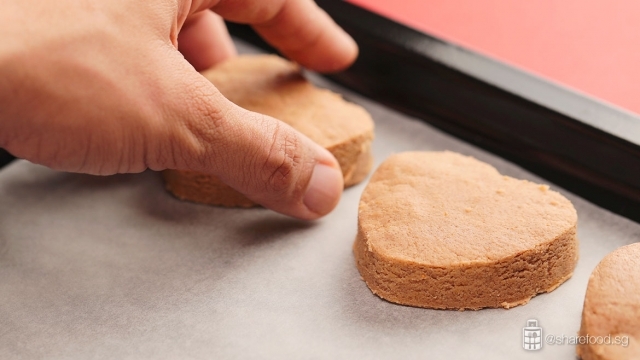 Once you’re done, place them slightly apart on the baking tray as the cookies will expand in size while they bake! Bake them for 10 minutes until they turn dark brown. Then, remove them from the oven and let cool. Remember to not move the cookies yet as they are still soft when warm! 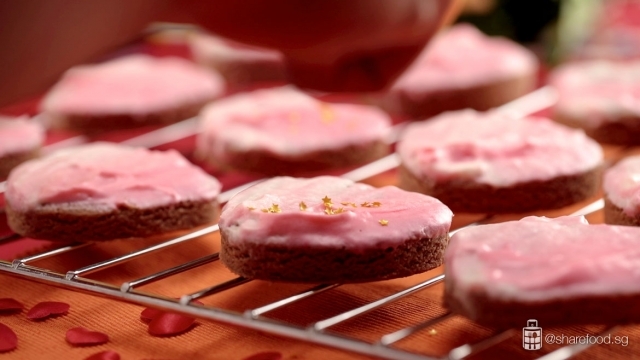 It’s time to prepare the strawberry glaze! Pour the whipping cream and sweetener into a stand mixer bowl and whisk till a soft peak. Divide the whip cream into two bowls. In one bowl, add protein powder and a few drops of colouring. Proceed to mix evenly. 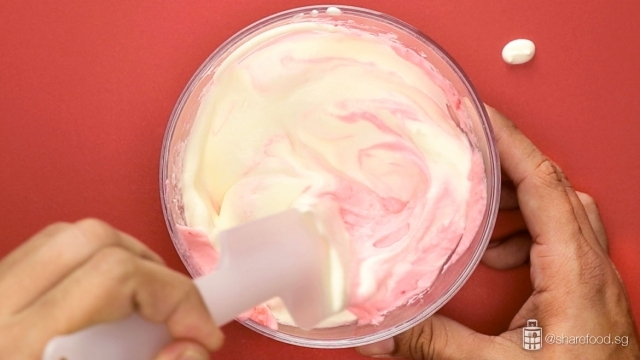 Then, combine both bowls of whipped cream and use a spatula to twirl them slightly to create a marble effect! 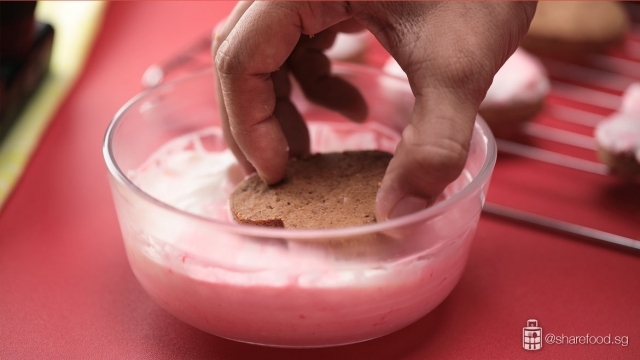 Lastly, dip the protein cookies into the whipped cream and top it off with sprinklers! Put them in the chiller to allow the whipped cream to harden and there you go! 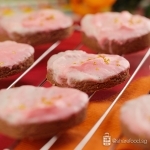 Protein Peanut Cookie with marbled strawberry glaze. 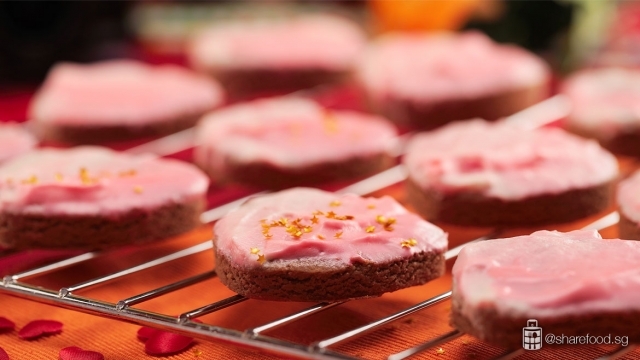 Make these healthy cookies for your loved ones this Valentines’ Day! Did I mention that these cookies are only 100 calories? What are you waiting for? 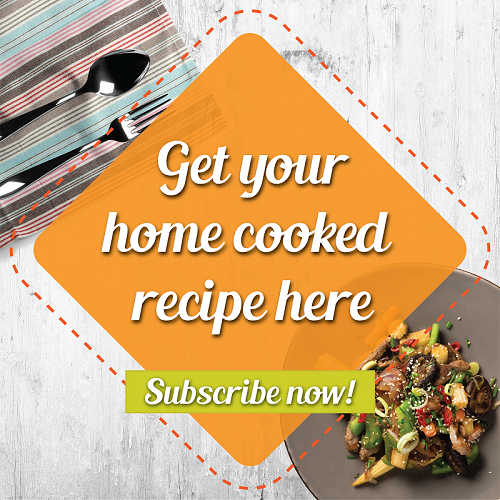 Grab this simple recipe today! Pre-heat the oven at 180oC. Lined baking tray with parchment paper. Add all the cookie’s ingredients into a large mixing bowl. Use hands to mix the ingredients. 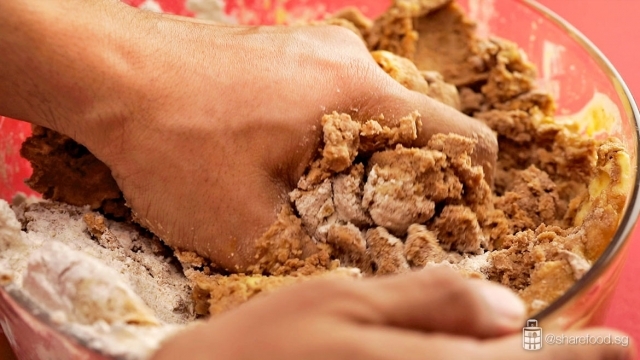 The dough should be crumbly but still comes together when grabbed together. If it doesn’t come together, add in 1 tbsp of water gradually. Grab a ball of cookie dough and place it on a flat surface. 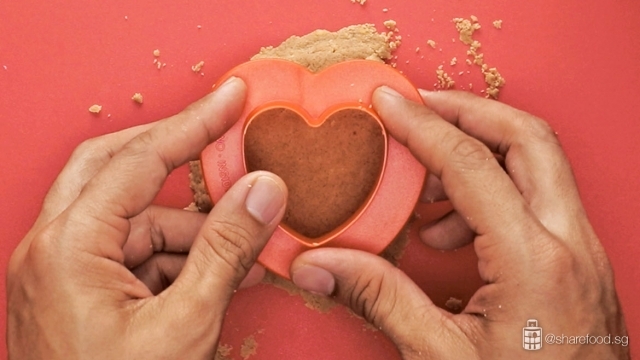 Flatten the dough to about ½ inch thickness and cut it using a heart shape cookie cutter. Repeat the same steps for the remaining dough. Place it on the baking tray with 1.5 inch gap between each cookies. The cookies will spread a little as it bakes. Bake for 10 mins till it’s turns to a darker shade of brown. Remove from oven and let cool to room temperature for at least 20 mins. The cookies are soft when it’s warm, hence do not move it as it will break. Pour the whipping cream and sweetener into a stand mixer bowl. Whisk till soft peak. Divide the whipped cream into 2 bowls. Add protein powder and 2 drops of colouring, mix evenly. Add in more colouring as desired. Pour the pink whipped cream into the white cream. Use a spatula to twirl them slightly to create the marble effect. Dipped the protein cookies into the whipped cream and top it with your favourite sprinklers. Transfer to the chiller to harden the whipped cream.